A useful call for redesign of global geo-politics? When I began to ink this text, what my mind was struck by, was, the beautiful Teaching of Wisdom, compassionately elucidated by the Buddha. That is Middle Path and the eternity of its power. The Buddha’s path comprises a frank relevance, a doctrinal depth and an orientation to growth for a balanced sophistication of international politics. If we are to be constrained by the present century of civilization, at first it was by cold war, the said balance was maintained, though it is a debatable proposition. The efficient actors were the Soviet Union and the United States, along with the protagonists of Europe. One camp belonged to the socio-economic formation of Socialism. The other constituted the texture of Capitalism with Europe, having United States at its head. There was Non- alignment too. But, it was not the final resolute factor in the determination of weighty global issues. Circumferentially, the inter-action of the subjects of International Law, appeared to have been in discordance and in incongruence. Nevertheless, the needed balance was always available. Now, the socialism-rooted Soviet Union has ceased and, therein, the governance of Russia is grounded on a polity, structured in to a market economy. The socio-economic status of the two quarters has reached the parity, yet, the contradiction continued to exist. The difference between the two interest-inviting epochs was as follows: In the socialism-Capitalism era, the contradiction had been based on the fundamental doctrines and it was present in the periphery. It was discernible. In the second age of market economy, the discrepancy is not conspicuous at the circumference, but, the conflict seems to have been deposited in the unseen center of the relationship realm. In recent times, Russia observed silence in numerous international issues, it could intervene in to. This non-intervening transient tranquility of Russia ushered the affairs of the globe, in to a tangle, the disentanglement of which depicted virtually very much complicated than expected. Now, dropping its quietude, by intervening in to the Syrian crisis, Russia powerfully voices; “Come on guys we are”. The empirical emergence of Russia, to wage a powerful battle against the finger-chopping and neck-cutting terrorism of Islam State of Iraq and Syria (ISIS) issues a powerful call to all actors of international arena, concerning a fresh relationship balance, that was present in absence, not to be lop-sided in their global relationship management. Of this, is a voicey and useful warning, Sri Lanka should not and cannot be deaf about. This is a turning point; the foreign policy of Sri Lanka must be subjected to a decent and discernible re-alignment, with the pursuit of the diplomacy of relationship equilibrium. In such a concatenation of circumstances, it is perceptibly pertinent to explore an exegetical elaboration of the pragmatic eruption of Russia in the Syrian crisis. Before traversing across the essence of paradigm-shift, being proposed by the Russian factor of military intervention in Syria, the writer of the present text, as an expert of International Law, wishes to digest the concept of Non-alignment as a principle, applicable to the management of international relations. The Non-alignment has a vision. That is to strengthen national capacities and collective self-reliance of developing countries. The mission of Non-alignment is to contribute to the acceleration and enhancement of national development by strengthening and expanding South-South technical cooperation in the context of international development collaboration. Its objective comprises the achievement of the development goal of developing countries and to attain a sustained, people-centered development and to enable developing countries to become equal partners in international relations, without being victimized by international geo-block politics. Can a country, as a subject of International Law, be non-aligned? Can, a State exist among the members of the international community and be free from it simultaneously? In the void of such a freedom, can a Government be established in the state of Non-alignment? These are important questions; one must pose, to comprehend the practicality and fruitfulness of the concept of Non-alignment, as a principle of global relationship regulation. I discussed this subject-matter, yet as an International Law scholar, with many personalities of differing domains. My non-Sri Lankan university professors disagreed with it with no reservations. For American and European international Lawyers, it became a laughing stuff. Yet other intellectuals, unconnected to legal realm had an agnostic approach. The Russian cosmonaut, Comrade Alexiy Koseegin, who was the first human being to come out to the emptiness of the cosmos, in my majestic encounter with him, back in Kiev, said,… “Gamini, it was only in the cosmos, thousands of miles away from the planet earth, while floating in the air, in the state of non-gravity, I, sometimes felt that I was non-aligned”. Now coming back to Sri Lanka, only two Sri Lankan politicians disagreed with the Non-alignment, as a fruitful and logical principle of global relationship management. One was the JVP leader, Mr. Anura Kumara Dissanayaka, who expressed his view, in one of my politico-philosophical discussion with him at JVP head office at Battaramulla. The other was, the first President of Sri Lanka, J. R. Jayewardene, who, as a brilliant lawyer and as an empirical follower of the Buddha, illustrated what follows: “Gamini, your dad, Pani Ilangakoon is a founder member of SLFP and the MP for Weligama. I am the leader of UNP. Yet, I am totally aligned to your father. One can be non-aligned, if it is during one’s life time, only on the attainment of Arhathood (enlightenment) or if the case were to be referred to the after death status, it is only in Nirvaana (Liberation) that one can be non-aligned”. Thus, in such a terse exegetical backdrop, the determination of the question; that the orientation of the foreign policy of Sri Lanka must be non-aligned or aligned, generates a heated debate. What the writer of the present textual analysis proposes is dynamic alignment in place of non-alignment. In fact, the history of the external affairs of Sri Lanka is a story of more alignment than non-alignment.. In 1970s it was aligned to India and China. After 1977, its alignment was with the West and USA. Again, from 2010 and onwards, the direction of the Sri Lanka foreign policy had been rooted in China. Yet, during all such periods, what Sri Lanka declared was non-alignment as its foreign policy. This is where; the context of Dynamic Alignment, the present writer suggests stems from. Thus, in the era of dynamic alignment, the Russian factor, the flexing of its powerful muscle in Syrian crisis, erupts in to the very center of the think-tank of Sri Lanka foreign policy. Now, coming back to our original subject, absorbing the relevance of alignment, it was reported that President Putin’s address to the Verkhnaya Palaata (Supreme Council) was unexpected, but the whole course of events led to nothing else, but to an increase of military support that went to Damascus, and to the possibility of using Russian military aviation therein. In his recent New York visit, Putin, responding to a question about the possibility of air strikes against the captured territory by Islamic caliphate, said, that he thinks about it and did not rule out, adding, that Russia will only act in full accordance with the norms and principles of international law, that is, with the authorization of the Security Council of the United Nations or upon request of the Syrian authorities. It is clear, that Damascus had long since, turned to Moscow, with such a request, but it was not officially voiced before the decision. That, apparently, was finally decided after a meeting with Obama, during which, Putin could discuss two variants of Russia's participation in the war, against the transgressor, the Islamic State of Iraq and Syria Caliphate (ISIS). The first, which Putin proposed in his speech at the United Nations, was to create a global coalition and getting for it the mandate of the Security Council. If the United States supported this option, Russia desired to take part in operations in Syria in that format. But, negotiations with Obama made it clear that the United States does not want to go along this path and fight as part of a new coalition in concurrence with Russia. Besides US insisted that Moscow joined in the existing US-led coalition that does not include Syria and Iran, and on the top of that, the said coalition does not have a mandate of the UN Security Council. Or else to act on its own. That was the position held by United States. And how else, the US could respond to Putin's warning that Moscow has Assad's appeal that in the case of the rejection, by the United States, of the first version, Moscow will begin separate action in Syria? 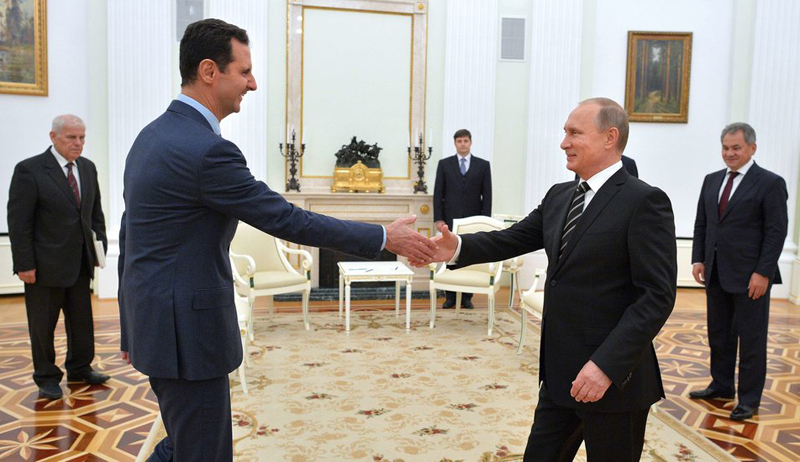 In fact, after the meeting-results with US President, President Putin took the final decision in relation to the subject of Syria that Russia will not act through the dictate of anybody and will be based on the request of the authorities of the republic and the agreement between the two countries, concluded in 1980. The second option was forced on Russia. The request made by the President of Syria was formally adopted, and President Putin sent an appeal to the Federation Council, which unanimously supported him. This would mean that Russian military aviation helps the Syrian army to regain control of the country, destroying the armed forces and communication structures of “Islam State of Iraq and Syria” terrorists and those hired terrorists who do not belong to Damascus, and then to leave Syria, indeed, retaining a continuing Russian military base in it. This form of Russian participation, and its major goal, the Russian Leader styled, the destruction of the militant, Islam Sate of Iraq and Syria terrorists, in the territories, they unlawfully seized, causing blood, pain and thousands of agonizing deaths. The Russian President further warned: ”Russia must act pre-empt, rather than waiting for them to come to our house”. The President recalled that the “ISIS Caliphate” has long declared Russia, an enemy and in its ranks fight thousands of immigrants from Russia and former Soviet countries. Warning appears to be the main purpose for which Russia went to war. But the war in Syria has many dimensions, each of which has its own importance for Russia in particular and a discerning weight for the glob in general. Namely, this is where, a new and a dynamic redesign of global and regional geo-politics flexes its muscle for a new vision and a fresh mission. It is Syria itself. Who needs a global and a dragging war in the region, a war that could escalate into the culmination of a nuclear war and become the start of a new world war? The Americans or Russians? It is a big question with capital “B”. Even if one were to believe in the theory of controlled chaos, one must recognize that some states of vested interest are now seeming to be losing the Middle East. It is too great a price for any long-lasting goals on a global scale. Now, no one, already, has the strength and will, to gather the scattered stones - the Damascus too is no longer able to do so. A particular vested interest, like the Saudis, dream to overthrow Assad. Iran, a Shiite country, can not intervene in full force, risking sharpening the so propagated slogan- “Sunni-Shiite war”. And in these conditions, what is consolidated is the terrorism of “Islam State of Iraq and Syria Caliphate” that everyone recognizes, the main threat to the world. Given this, the only means to stop the “Caliphate terrorism” growth in the region is, the restoration of a unified Syria, as early as possible. It is the Middle-east region itself and not a particular country. Russia is not interested in the collapse of Syria. Its collapse will hit across the Middle East region - an area of Russia’s national interests and what really attracts Russia is a region-wide picture, across the Middle-East. Loud was the exit of Russia from the Middle-east region. On the eve of the unfortunate collapse, the Soviet Union did not stop the campaign against Iraq, and then completely melted in the air, like a genie in Muslim tales. National interests in the region were betrayed, thrown out and forgotten, but what to say about the Middle East, when the same has been done in relation to their own country and neighbouring regions. From zero, Russia began to return to the Middle-east region, and after the “Arab Spring”, Russia went to work actively with all the countries and to develop a comprehensive regional policy. Against the backdrop of the chaos that resulted from both domestic crisis and international geo-politics of some vested interest in the Middle-east region, Russian position had to be reshaped and strengthened. Redesigning processes of the geo-politics of the Middle-east region are shown, not only to have begun, but also to be continuing. And exactly, this is the useful Russian call, the writer of the present text heralds above. With all the differences with the neighbors of Syria, the fact of Russia’s consistent support for its ally was, for countries in the Middle-east region, the best proof of the seriousness of the strategic and powerful return of Russia, to the Middle East, and of Russia’s absolute fidelity, total dedication, ceaseless allegiance and motivational exactitude to the given word. It is the international impact itself. Of course, the war with the finger-chopping and neck-cutting terrorism of Islamic Caliphate refers to the issues of global level - both on the level of ambition of the caliphate, and the complexity of defeating it. And to understand this, it is not even necessary to consider the caliphate as a “Project of certain vested interest”. In reality, some are just trying to use Islam State and the terrorism of its members, to meet their own goals, wherein indeed, about any control over the caliphate cannot be even spoken about. Yet, one can just imagine what would happen, in the event of a victorious march to an “Islamic state” and its geo-politics redesign. However, the natural tendency of many Muslims to unite, and the caliphate was a prerequisite for the formation of what is now called the “Islamic caliphate” headed by the Caliph Abu Bakr al-Baghdadi. The intervention of external players: special services and then the authorities of the West, the Gulf, Islamist radicals from around the world and Islamist armed insurgency such as “al-Qaeda”, turned the territory of Iraq and Syria in to an unprecedented domain of experiments,…. Wherein, finger chopping and head cutting videos of infidels were made, as if specially designed, to weaken the will and to impair the courage of the world, to resist and get terrified, turn away and leaving the territory of the Caliphate alone. The Management of circumstances between Russia and ISIS has culminated in to a level, as it was between the Government of Sri Lanka and LTTE terrorists. First crush and defeat, then to deal with those who called themselves what. This now is the only acceptable approach. And the fact that Russia is going to muster its military might to materialize the above, would mean that it takes on a huge responsibility. And this responsibility and determination of Russia, are not only just making all propaganda of vested interest funny, about the “isolation of Russia” or the slogan “ Russian threat to the world,”. On the contrary, it will clearly show the international community, “who is who” and the peace and balance of power-oriented alignment with super powers in the relationship regulation of international domains, is an indispensable imperative. The aggression of the certain states has always been aimed, not at eliminating the threat to their security itself, but at scrapping countries for the establishment of an order of privileged geo-politics, in which such states would be the conductors and beneficiaries. And now Russia goes to war and surprisingly, again at the request of the legitimate government, that is the Syrian authorities, who are trying to save the country from the consequences, of the same alien aggression. Herein, Russia can be seen to be demonstrating, that Russia is the main defender of national sovereignty of any country in the world, and that may be relevant for any country in the era of economically forced geo-politics of globalization? Sri Lanka cannot be bereft of the immense dimension of this diplomacy depth. No super power, Russia included, must be under underestimated. What is need is the discovery of right super-power international balance, through the insight of doctrinally and pragmatically armed diplomacy experts, for Sri Lanka to benefit. Diplomacy is not a domain of dogmatic fools of inflexibility, rooted in vanity, deposited in vainglory and conceit. It is a beautiful art and science of the establishment of international relationship equilibrium. This is the fruitful call of Russia, the writer of the present text heralds above.